The weather is temperate, with marine influence in the South; average rain in the year amounts to 1,100 mm, and average temperature to 18º C, ranging from 6ºC in the winter and 32ºC in the summer. The maximum distances are 700 km from North to South and 600 km from East to West. 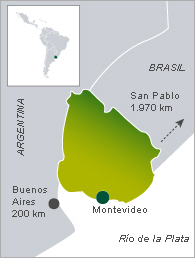 The country has some 500 km of coastline on the River Plate and the Atlantic Ocean. This offers easy access from the production establishment to ports, beaches and tourism resorts.